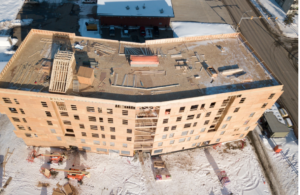 Currently under construction, this 6 storey and 50 unit building is slated to become Canada’s 2nd largest certified Passive House Building located in Fort St. John, Canada. It is also a first worldwide, as it is slated to become he Northernmost multi-storey Multifamily Building achieving the stringent international Passive House Standard. This collaboration project between BC Hydro and BC Housing is scheduled for occupancy in early 2019 and will be home to some BC Hydro workers and their families and provide affordable rental housing to the community. 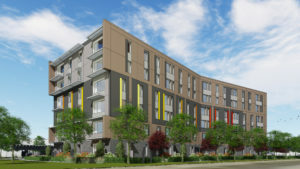 BC Housing is leading the development, construction, management and operation of the building. Later this year, BC Housing will seek a non-profit building operator through a public contracting process. The building operator and BC Housing will share information regarding eligibility and how to apply for the affordable housing units.